Why Is Your Residency Personal Statement so Important? Applying to residency programs is done through ERAS, the Electronic Residency Application Service which is run through the AAMC. The information required for your application is all uploaded through the system allowing you to apply to any of the programs through one system. Key to your application is more often than not is your residency or fellowship personal statement. 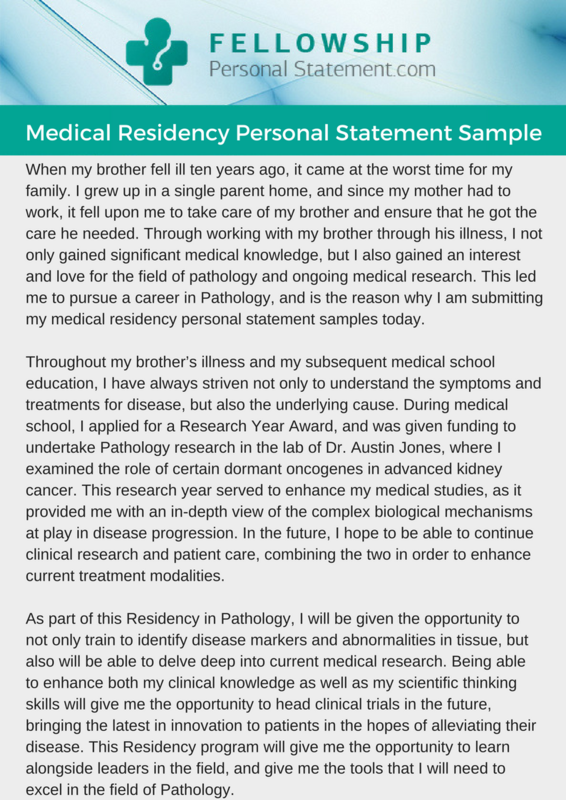 The medical residency personal statement is the most important part of your application as it is the only part that you have control of through which you can sell yourself to the program. However, you only have a very limited amount of space in which to write your personal statement and our fellowship personal statement service can help you. It can take up just a single page on their system which usually means around 700 to 800 words in length. A well-written ERAS personal statement is going to get you noticed by the admissions officers reading it. Often far more effectively than your results, qualifications and other achievements, after all of the other applicants are going to be high achievers to have reached as far as you have. So your statement is your opportunity to differentiate yourself from all of those others that you are competing against so that your name will be the first that they think of. 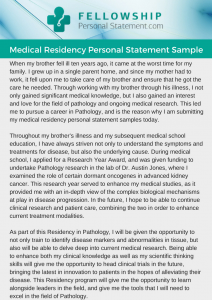 What Are the Aims of Your Medical Residency Personal Statement? That you have a real interest in your specialty area: they are looking for an applicant that has clear reasons for wanting to work with them in their chosen specialty. You need to make it clear how you became interested and what steps you have already taken to follow this choice including things such as an observership. Demonstrate your passion for your chosen medical specialty. That you will be able to work as part of their team: they are not going to be looking for an applicant that is out to brag about everything that they have done. They are trying to build a strong team that can work together successfully for the benefit of the patients. So ensure that your statement is able to demonstrate this rather than sounding overly arrogant. That you have clear future career goals: your residency is a stepping stone for your future career and you need to demonstrate that your choices will support the career ambitions that you have. That you have the skills and the strengths required to succeed in the program: clearly show why it is that you are going to make a perfect resident on their program. What is it about you that will make you fit in and succeed. Do not simply list your exam scores, they will want to know more about some of your interpersonal skills. Why you are applying to their program: you need to show that you are not simply applying to them in case the program that you really want does not accept you (even if this is the case!) You need to do your homework and show that you know what their program offers and what you hope to take from it. How Should You Organize Your Residency Personal Statement Outline? Introduction: this should clearly show the reader why you are pursuing your chosen specialty. Use a personal anecdote that will help you to get their attention right from the start. This can be anything from a specific patient encounter that helped to mold your future aspirations to how a mentor has led you to where you are now. At the end of this section, the reader should be in no doubt that you want to follow this specialty. Main body: this is where you show how well suited you are to their program. Show what is that you hope to gain from their program and also what it is that you are bringing to the party. Clearly, demonstrate the skills and qualities that will make you a great resident on their program. Conclusion: this final section should provide them with a clear understanding of just where your career is going to head once you have completed your residency. Do not make this an absolute statement as you want them to see that you have some flexibility in your future plans. Also, ensure that the conclusion ties back to the opening paragraph to help tie your ambitions and passions together. What Mistakes Must Be Avoided When Writing Your ERAS Personal Statement? Being overconfident or arrogant: they are not going to want to accept someone that is presenting themselves an overconfident braggart. They need people that are going to fit into their team and that are willing to learn. So do not include your highest test scores and other information to try to make yourself look bigger. Show the skills that make you fit in perfectly with their program. Ask others to read through your statement to ensure that you avoid these issues. No purpose: they want to have clear reasons as to why you are following your specialty and where you intend to go. Those that fail to convey a good sense of purpose and direction are unlikely to be selected for their program even if they have excellent skills. Making excuses: your personal statement really does need to sell you, not make excuses for something that is not perfect in your application such as a low score or time out of your studies. This is not the place for this information to be presented. Always make your personal statement completely positive from start to finish. How Should You Write Your Personal Statement for Residency? When should you start your writing? A rushed personal statement is not going to get you anywhere. Start very early, January of the year you are applying is not too early! You will likely go through many revisions of your statement so the earlier you start the more chance you have of submitting something that you feel will be effective. How many statements should you write? At a bare minimum, you should write at least one statement for every specialty or subspecialty that you are applying to. Your statement must be able to demonstrate your reasons for why you want to follow that specialty so one statement will not cut it if you are applying to more than one. You may also want to tailor your statement to specifically target each program. The more specific your statement targets the program the more likely they are to see you as a committed applicant and to ask you to interview. How can you make your statement unique? A personal statement is about you so this provides you with a huge amount of scope to find something totally unique about which to write. A good statement will offer the reader a good insight into who you are rather than simply list skills and qualification as in your resume. Try to use a personal anecdote around which to base your writing. Often this will revolve around what drew you to your specialty whether it was a specific encounter with a patient or something from your personal background. Should you get help with your statement? Not every applicant is as skilled with the English language as the next so often it can be an advantage to use residency personal statement writing services. Services such as ours provide you with a real edge over the competition as the writers will have many years of experience and will know just what works and what should be avoided. Whether you need a full writing service or a final residency personal statement edit the advantage that a professional service offers should not be dismissed out of hand. Outline your medium to long-term goals: typically your medium-term goals will be something like applying to a fellowship after you complete your residency with your long-term goals being your long-term career goals. Show your short-term goals: this will outline the specific things that you will need to do to achieve the medium and long-term goals that you have outlined. Tie it to the program: demonstrate what it is about the program that they offer that allows you to meet all of your goals effectively. Wrap up your conclusion: make the point clearly that you wish to be accepted into their program and that it allows you to meet your aims. Keep your points concise and do not make any additional points after. You want a clear finish to your statement. How Can Our Residency Personal Statement Writing Services Help You? Why Should You Choose Us to Work With? Experts that hold postgraduate degrees and have many years of experience supporting ERAS applications. Original writing that is done with you to assure your unique personal statement that is provided with a plagiarism report. Free proofreading on each service that is provided to make sure your statement will not contain any errors. Delivery inside of your chosen deadline even with a tight turnaround. Guaranteed full satisfaction with the quality of your medical residency personal statement or we will offer you a refund. Work with the best consultants here today to ensure that your medical residency personal statement will get the full attention of the admissions officers.